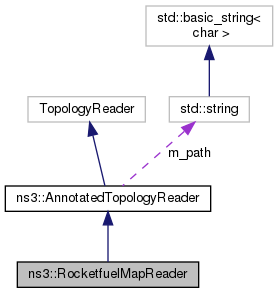 Topology file reader and topology estimator (extension of Rocketfuel-format type). As some of the .cch files do not give a connected network graph, this reader also allows to keep only the largest connected network graph component. Definition at line 80 of file rocketfuel-map-reader.hpp. const string & referenceOspfRate = "100Mbps"
Definition at line 63 of file rocketfuel-map-reader.cpp. Definition at line 71 of file rocketfuel-map-reader.cpp. Definition at line 76 of file rocketfuel-map-reader.cpp. Definition at line 268 of file rocketfuel-map-reader.cpp. 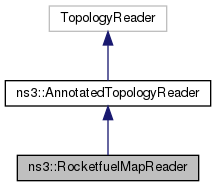 References ns3::AnnotatedTopologyReader::ApplySettings(), ns3::RocketfuelParams::averageRtt, ns3::RocketfuelParams::clientNodeDegrees, ns3::AnnotatedTopologyReader::CreateNode(), nonstd::variants::get(), ns3::AnnotatedTopologyReader::GetLinks(), ns3::AnnotatedTopologyReader::m_nodes, ns3::RocketfuelParams::maxb2bBandwidth, ns3::RocketfuelParams::maxb2bDelay, ns3::RocketfuelParams::maxb2gBandwidth, ns3::RocketfuelParams::maxb2gDelay, ns3::RocketfuelParams::maxg2cBandwidth, ns3::RocketfuelParams::maxg2cDelay, ns3::RocketfuelParams::minb2bBandwidth, ns3::RocketfuelParams::minb2bDelay, ns3::RocketfuelParams::minb2gBandwidth, ns3::RocketfuelParams::minb2gDelay, ns3::RocketfuelParams::ming2cBandwidth, ns3::RocketfuelParams::ming2cDelay, REGMATCH_MAX, and ROCKETFUEL_MAPS_LINE. Definition at line 466 of file rocketfuel-map-reader.cpp. Definition at line 472 of file rocketfuel-map-reader.cpp. Definition at line 478 of file rocketfuel-map-reader.cpp. Definition at line 496 of file rocketfuel-map-reader.cpp. Definition at line 596 of file rocketfuel-map-reader.cpp.